Selma Brynolf holds a Post doc shared between two departments at Chalmers, Space, Earth and Environment and Mechanics and Maritime Sciences. 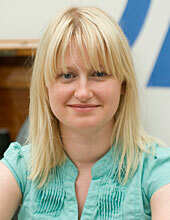 Selma’s research is within the area of energy and environmental systems analysis. The focus is on future marine fuels, global energy systems modelling, assessment of marine fuels environmental impact from a life cycle perspective and assessment of electrofuels (fuels produced from carbon dioxide and water with the help of electricity). The research is linked to two of Chalmers Areas of Advance Transport and Energy and parts of the research are also connected to the maritime competence centre Lighthouse. Methods and Tools for Environmental Assessment. There might be more projects where Selma Brynolf participates, but you have to be logged in as a Chalmers employee to see them.